Here is some information and applications of good bird work and some application of bad bird work that is easy to spot when looking around at buildings and homes in your area. Check out our Dirty Bird Pictures. 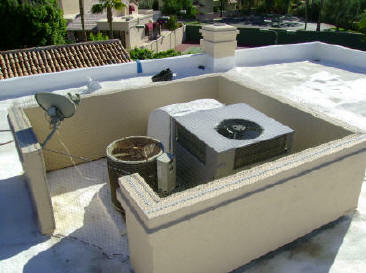 Arizona Wings N' Stings has been excluding pigeons and other types of birds from all sorts of different styles of residential homes for over 11 years and over 5,000 homes and satisfied customers so far. Many things need to be considered before a plan of attack can be developed for each situation and building, many times several different exclusion or deterrent methods may be needed to bird proof a building or structure and possible even trapping to reduce the size of the flock. 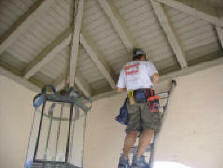 Pigeons nesting under the roof overhangs, on pillars, beams or just sitting on the roof ridges is what the majority of our calls are about when we are dealing with residential homes. What we also find is that pigeons will start nesting in a neighborhood on the 2 story homes first if they are on the South side of the street, facing North since this area provides shade to the front of the home where most of the roof overhangs and pillars or beams area are located. 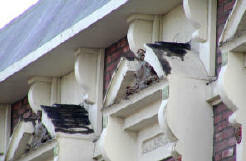 Sparrow nesting is also a problem when they get under the roof tiles or through the small round vent holes below the fascia boards. Their nests are made up of grass and twigs and can easily catch fire if a grill is below the nest. Please call Arizona Wings N' Stings today and we can schedule a day and time where we will come out to your home and give you a written proposal on how we can solve your bird control problems, along with details of the areas we would be treating and with what products. Most of the time we will be doing the cleaning and nest removal and then installing products that should last many years to come. Bird control work on a home is a little different than commercial buildings because the bird problem is usually closer to the ground given the size of the building and the bad habit birds have of nesting above entry points, eave overhangs and roof ridges on the house. Birds especially pigeons like to nest in roof line overhangs since they offer protection from the sun and predators flying overhead. The problem is that this area is just above the door way and as the pigeon feces builds up it rolls down the tiles onto the walkway below, creating slip and fall hazards and can also get into the air you breath. 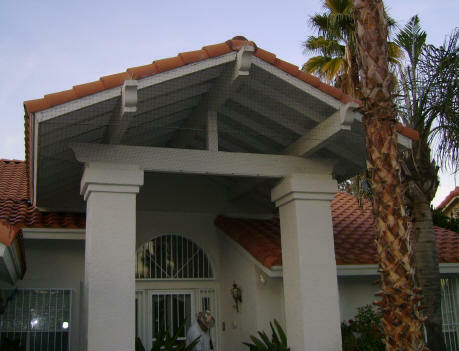 Exclusion net, screen or shock systems of the tile areas is the best solution to this problem. Spike in an area like this will allow the birds a good nest site, since they can walk up to the spike and drop twigs into the spike and build up the area for a nesting site. Today's home builders are putting up home so fast that attention to detail is very poor. Some subcontractors that do the framing or roofing work appear to not have any pride in their work as is evident buy all the unfinished overhangs and other locations that pigeons can get into an attic. 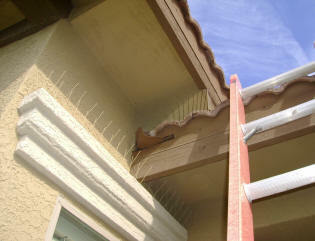 Make sure that your eaves and vents are closed so as not to allow birds into your attic. 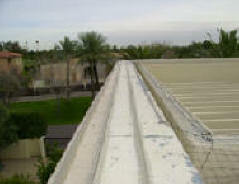 Pigeon feces, feathers can get into you air duct system and cause health problems for you and your family. host internally 60 types of infectious diseases. When we show up we have the training, the tools, drills, ladders and materials to do the job right the 1st time. Most gels are petroleum base products and will dry out after a period of time depending on climate extremes, in the Southwest about 3-6 months if you are lucky. When the gel semi-dries out it turns black and will leave a sticky mess that attracts feathers, dust, feces and sometime small song birds, but at this point it doesn't keep pigeons away it just looks bad and by then your check has cleared. There are some gels coming onto the market that clean up with soap and water or "Simple Green"
When dealing with a bird problem ask yourself these questions..
-Do they have a good or constant food or water source, nesting sites?. How long have they been at this location ? -Birds are easier to move out of a structure if they just got there then if they were there for 5 years or worse yet born at the home. What are they doing to be a nuisance? -Birds sitting above entry ways create Slip & Fall Hazards and pigeons nesting around your A/C unit can possible contaminate the air you breath inside your home or office. 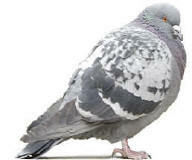 Pigeons around a business can give customers a bad image of the building and the pigeon or bird droppings are tracked into the business's inside. What type of design or materials is the building ? - Structures with lots of shaded ledges and multi-stories draw pigeons like a magnet. Homes that are on the South side of the street facing North seem to have more problems with pigeons nesting since the front of the home is more shaded.